During the Second World War, when Hiroshi Teshigahara was a schoolboy, Japan’s cities—above all his hometown, Tokyo—were mercilessly firebombed. He, and his future associates in countless artistic undertakings, returned to a landscape of bleak ruins. The adolescent Hiroshi was particularly attuned to his environment. His father, Sofu, was the iemoto, or “master,” of an international chain of ikebana (flower arranging) schools and was also an avant-garde artist to whom aspects of landscape were of signal importance. While growing up, Hiroshi had been exposed to art books, paintings, and the conversation of artistic visitors from all over the world. These encounters prepared him for an inevitable education as an artist after the war. In art school he developed his skills as a draftsman and painter, laying the groundwork for his future activities as a multidiscipline artist. His generation was charged with building a way to exist in the desperate circumstances they had inherited. Myriad groups formed and dissolved, dedicated to passionate discussion and sometimes group demonstrations. 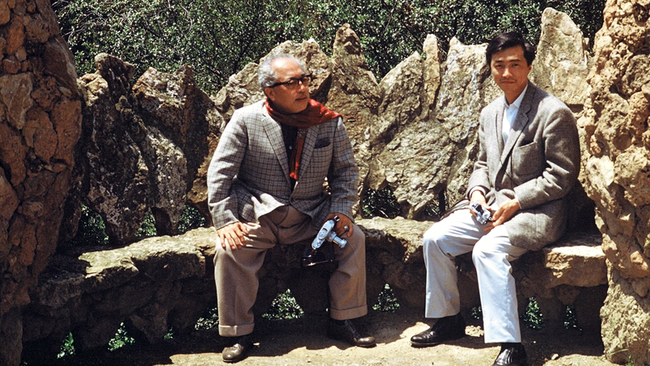 Hiroshi was in the thick of it, listening, expounding, and living a bohemian life. Prominent survivors of the prewar avant-garde, who had spent all their youth in Paris, exhorted young artists to build a totally new culture, expunging all memory of the militaristic milieu of their childhood. Hiroshi listened. He heard, and never forgot, the message of Taro Okamoto: extreme contrasts, “violently dissonant” relations, conflict and opposites, must be held in balance. Okamoto also spoke of what he called “total art,” and was largely responsible for the pronounced tendency of Hiroshi and his friends toward a union of all genres—a modern adaptation of Wagner’s Gesamtkunstwerk. In 1959 Sofu Teshigahara embarked on a journey to Europe and the United States, bringing with him an entourage of assistants that included his son Hiroshi. For the younger Teshigahara, who had restlessly explored painting, printmaking, sculpture, and, in a rudimentary way, the one art form his father had never engaged with, filmmaking, this voyage was to be a defining moment in his life. A sojourn in New York, where he discovered a wholly different avant-garde that spent little time in endless aesthetic and political discussions, liberated him and also provided him with experiences he could never have had in Tokyo, such as the discovery of the American boxer José Torres, who would later be the subject of one of his early experimental films. He would explore those possibilities extensively on his return to Japan. Not only did he intensify his earlier interest in film, especially European films—including those of the Italian neorealists, the French experimentalists, and especially Buñuel—but he began editing his own footage of both José Torres and Gaudí’s architecture. He also took over the auditorium of his father’s Sogetsu school, where, as impresario, he established a film series and hosted performances of such stellar international artists as John Cage, Robert Rauschenberg, Merce Cunningham, and Yoko Ono, as well as early Butoh theater events. He saw his responsibility as an educational one. Having been distracted in his own youth by political questions and debates, and ideas of “revolution,” he meant to impress upon the next generation the importance of artistic life on its own terms. In the course of his hectic managerial life, he himself was drawn ever more certainly into a condition of being a total-work-of-art worker—something that greatly broadened his views when he became a feature-film maker. Retrieving Taro Okamoto’s lessons, Teshigahara embarked on his own films, all of which, fiction and documentary, are marked by his interest in contrasts, and often contradictions. His training as a painter helped him to focus on details, on filmic translations of light and dark, and on the framing of crucial shots. His own conflicts concerning documentaries were resolved when he finally—twenty years after his encounter with Gaudí—began his second film focusing on a visual artist. The documentary, he said, was not necessarily a means of recording or reflecting reality but rather was “the presentation of the subject construed and perceived through particular human eyes.” In Antonio Gaudí, Teshigahara enlisted his own eyes, trained to discern painterly and sculptural detail, to present a vivid portrait of a fellow artist. Retaining the footage from his first visit to Barcelona, Teshigahara made a second journey in 1984, to explore Gaudí’s oeuvre in depth and add essential details. It is clear that he immersed himself in the life and times of Gaudí and knew a great deal about the Catalan modernista when he began, but that knowledge is conveyed almost entirely by means of views of the master’s works. In the Gaudí film, as in Hokusai, he draws the viewer into his subject by first establishing circumstantial facts: a general view of contemporary Barcelona; a stroll through its Gothic quarter, and another down the famous Ramblas, leading to the sea; a quick glimpse of a street work by Barcelona’s foremost living artist, Antoni Tàpies; a shot of the citizens of Barcelona performing their ancient round dance, the sardana; and excellent shots of the spectacular Romanesque murals of the twelfth century now housed in the museum on Montjuïc. Once he has set the scene, Teshigahara brings his camera into Gaudí’s universe, inviting us to examine sculptural details and then taking us up a characteristic Gaudí spiral staircase. The spiral motif is associated with nature’s best spiral, the seashell, which Takemitsu’s soundtrack emphasizes with the sound of the distant sea. Once we are launched into the profusion of Gaudí’s architectural and pictorial motifs, Teshigahara, in wonderfully paced rhythmic sequences, sets out, with the precision of a good art historian, to illuminate the unique character of Gaudí’s imagination—or, perhaps, to speak of his own affinities with the eccentric Catalan’s vision. Like Gaudí, Teshigahara harbored a reverence for the concept of Nature. Gaudí said many times that he was a student of “the great book of Nature” and believed that “all styles are organisms related to nature.” Teshigahara himself had become increasingly aware of both the diversity and extravagance of natural form. His generation had turned back to the great Japanese tradition of landscaping and Zen gardens, in which they rightly saw the perfect embodiment of the “total work of art.” In Teshigahara’s visual cataloging of Gaudí’s imagination, he is always aware of the fantasy spawned by Gaudí’s observations of growth and metamorphosis, drawn directly from close observation of plants, trees, grottoes, fountains, and the sea. Moreover, Teshigahara was particularly sensitive to the way Gaudí dealt with natural tensions in his use of parabolic and hyperbolic forms (forms that Teshigahara would develop later in his extraordinary bamboo structures). Gaudí’s pictorial and sculptural penchant has always astounded viewers, and Teshigahara was no exception. But with his crafts-man’s eye for detail, he scans with his camera the particulars of Gaudí’s sculptural fantasies, most notable on the rooftops of his Barcelona apartment houses and in the famous Park Güell. From close-ups to middle-distance shots, Gaudí’s exuberance as both a sculptor and a mosaic painter becomes eminently legible. Clearly Teshigahara had armed himself with a knowledge of Gaudí’s architectural sources—from Spanish Moorish sites such as the Alhambra to medieval Catalan churches to photographs Gaudí had seen as an architectural student of Byzantine structures and Gothic cathedrals—and deduced his originality. Gaudí may have been familiar with the old Arabic technique of trencadis, or fragmented tile or glass, but in his extravagance he turned it into a new pictorial technique. Teshigahara explores the sculptural chimneys and ventilators on several of Gaudí’s rooftops, and offers a summary in the lingering shots of the famed Park Güell. There Gaudí ceded to his longtime collaborator, Josep Jujol, the undulating surfaces of the terrace, covered finally with marvelous mosaic patterns created with shards of broken glass and tile. One of Gaudí’s most notable structural innovations was his use of leaning columns, sometimes specifically alluding to the growth of trees. Teshigahara carefully studies Gaudí’s unprecedented use of leaning pillars in his visit to the Colònia Güell, where Gaudí, in the celebrated crypt, first explored the dynamics of these skewed columns. From there Teshigahara takes us to the most fully developed vision of leaning pillars, in the Park Güell, lingering in the gallery and offering views of the terraces and palm trees from the shaded colonnade. Before he moves on, for the last part of the film, to the spectacular towers of Gaudí’s unfinished cathedral, the Sagrada Família, Teshigahara turns his camera on some of Catalonia’s most curious rock formations, alluding delicately to the source of Gaudí’s inspiration for the strangeness of the towers that loom so prominently over the city of Barcelona. Then, in his camera description of the curious details, Teshigahara subtly remarks on Gaudí’s piety, which led him to embellish his cathedral with often specious detail. Gaudí worked on the monumental project for the last years of his life: from 1884 until his death in 1926. The great spires were finished after his death, and no one can be certain if they are faithful to Gaudí’s vision, since during the civil war his workshop was ransacked and his models and drawings destroyed. All the same, as Teshigahara understood, the originality of the spiral-based structures is indisputable and still draws tourists from all over the world. The eye of an artistic critic and historian functions in the camera work of Antonio Gaudí, lending the entire film an appropriate historical aura. The project remains faithful to Teshigahara’s principle: it is an outstanding documentary seen through an individual’s eye and mind, through his own sensibility, interpreting in a scholarly way the work of a great visionary. Dore Ashton is an author and critic. Her books include The Delicate Thread: Teshigahara’s Life in Art; Noguchi East and West; About Rothko; A Critical Study of Philip Guston; A Fable of Modern Art; and The New York School: A Cultural Reckoning. She is a professor at the Cooper Union and a lecturer at Yale University and has curated many exhibitions in Europe, Japan, and the United States.